What Is FLL Jr., Anyway? Gather a team of up to 6 kids and at least 2 adults willing to coach. In August, FIRST will release a "challenge." For example, in 2014 the challenge was named "Think Tank." Teams had to choose a learning tool, reinvent it, and build a model of it in its place of learning. The same challenge runs world-wide. Glastonbury currently runs our FLL Jr. program January through March. Plan to meet once a week for about 8 weeks. Coaches can use lesson plans and notebooks for these meetings, included in the team registration fee and distributed by FIRST. The lesson plans help coaches guide the kids to choose a name for their team, to choose a topic to learn about, and to design a LEGO model to build. G-REC provides specialized kits for up to 17 Glastonbury Public School teams to borrow for the season. Use LEGO to build your model, which must contain at least one moving part and one simple machine. All the rules for the model are outlined in the official FIRST FLL Jr. materials, available only to registered coaches on the FIRST website. G-REC will lend you the WeDo 2.0, a required component of participation. Thanks to the Glastonbury Board of Education, as of 2017 we will also be able to lend each team one iPad, needed to program the WeDo 2.0. Design and create a trifold poster to present your ideas and details about your research and model. FLL Jr. teams are up to 6 children ages 6-10, typically in grades 1-4. Each team must have two adult volunteer coaches. Coaches must pass a background check (offered for free) by Glastonbury Public Schools (GPS). Some coaches must also pass a background check, also at no charge, through the FIRST website. It depends on which teams we can cover through a season's pass vs. which teams we register individually. Materials are lent to teams by G-REC for up to 17 teams per season. All teams are encouraged to register for an official FLL Jr. event to show off their work! 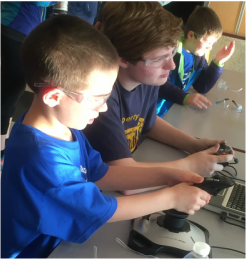 A participation fee of $27.00 to G-REC/Glastonbury Public Schools LEGO robotics club covers expenses such as the annual FIRST registration fee ($99 per team), the challenge-specific "Inspire Set," student and coach notebooks, presentation materials (scissors, glue, markers, pencils, trifolds, etc. ), the storage bins, team T-shirts, replacement LEGO parts, replacement motors and battery packs, new batteries for the motors, the WeDo 2.0, an iPad, and an Expo. For the Expo, medals, programs and entertainment alone total about $2,000. We are able to keep the price so low due to support from the Glastonbury Board of Education and community donations, many made by Travelers and UTC through Glastonbury coach volunteer hours. 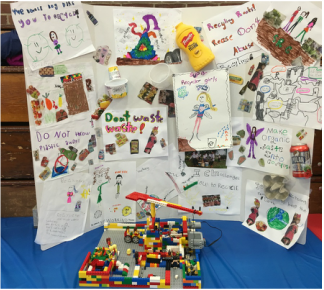 CLICK HERE to LEARN MORE about FLL Jr.
FLL Jr. project displayed at 2016 Expo. FLL Jr. students enjoy test driving Farmington High School Enforcers' robot.